New generation of Nintendo 3DS compatible flash cards has arrived at stores. 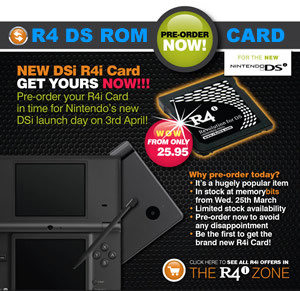 These new R4 3DS cards are being sold at the cheapest price ever, but are they any good? We have run our tests and can report that they do what is being promised, but read on to find just what it is. Earlier Nintendo R4 3DS compatible cards were not true 3DS Flash Cards, as they run in DS MODE and could not yet play 3DS roms. That all changed with GATEWAY 3DS card! 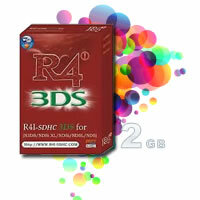 GW3DS is the first card that can play 3DS ROMs on the 3DS and is not limited to older NDS games on 3DS. Nonetheless there still is plenty of use for a R4 cards (and Gateway BLUE card is one of such) on 3DS even if it can not access all of the new consoles features. Nintendo DS and DSi roms along with the NES, GameBoy, GBA, SNES, SEGA and other Emulators, DivX Player, MP3 support - all this and more can be added with any R4 3DS flash card. DS Mode from GBA slot - The DS has to be tricked into booting in full DS mode. Rom Patching - The roms have to be patched, to change them to work from the GBA slot. Flash Card - The roms have to be stored and run from a flash card in the GBA slot. Saving - The saving in the game has to be taken care of. And for the new DSi consoles you need R4i SDHC Adapters - old R4 cards will not work on DSi, neither do M3, G6 or AK2 without "i". Nintendo 3DS compatible flash cards! 3DS has been cracked or more precisely the DS-MODE of the 3DS. Most DSi compatible R4 DS Flash Cards that had a firmware update option now can be upgraded to work with the latest version of the Nintendo 3DS firmware. My personal favorite 3DS flashcard is the SC3DS - an updated version of SuperCard DSTWO that works on 3DS. Of course it lets you play all the NDS and DSi games on N3DS, but it also adds SNES, GBA and MAME emulators and DivX video player! When a GBA game is started normally from the GBA slot the DS kicks into a mode that limits it to work just like a GBA. To get DS roms to run from the GBA slot you have to use some method to trick the DS into booting into full DS mode. What boot methods you can use depends on which version of firmware was your DS has. See DS Firmware for how to check your DS firmware version. SuperCard Mini SD Review Max Media Dock Review EZ Flash IV Review Brakken's NeoFlash MK3 Review M3 Mini SD & PassCard v2 Review Max Media Launcher Review M3 SD X CelShader's NeoFlash MK3 Review M3 Perfect SD Review M3 Perfect CF Review NeoFlash MK2 Review NeoFlash Magic Kit Review Neo-Max 1Gbit Review NeoFlash MagicKey 2 Review G6-Flash 3rd Generation Review Ewin 512mbit + Passme Review SuperPass DS Review NeoFlash 512Mb 3in1 Kit Review GBA Based Reviews EFA-Linker II 1Gbit Review SuperCard SD Review SuperCard CF Review EZ-Flash III 1Gbit Review EFA-Linker 512Mb Review EZF-Advance Review X-Rom 512Mbit Kit Review Other Reviews Nintendo DS Lite Review Qoob PRO Gamecube Modchip Review. When the idea of the NinjaDS emerged, several Nintendo DS owners dubbed it as a fake, as a hoax. Well apparently, they were dead wrong...but still, who can blame them right? The NinjaDS, in case you have got no clue about it, aims to be an all-in-one NDS homebrew device that functions pretty much the same way as your average NDS/GBA flashcarts and adapters, allowing you to execute .nds files. You may be thinking that it's just the same as other NDS dev products, but let me point out that unlike the others, the NinjaDS will function as a Passme/Passkey device and a SD card adapter. Plus, NinjaDS will not waste up your GBA slot, so you can still use it for a whole lot of other things that you please. It is a common belief that this one will be bundled with a ton of NDS software such as a built-in MP3 player, WiFi file transferring utility, and development-friendly software. The good news is that Team Ninja (the guys responsible for the NinjaDS) announced that this contraption is production ready. They have released some pics of the NinjaDS that will pretty much resemble the end product. Its release is expected in the coming weeks so watch out for that. For now, feel free to marvel at some of its pics. Compatible With Any Gbaflashcart, Nf, Scard, M3, Etc..
SDXC cards for up to 2TB storage even in micro SDXC format. Buy SDXC and use them in mobile phones, video game consoles or on PC as a backup drive. Faster write and read speed ensures that they can even host an OS! New DSflash card - DS-Xtreme DS-X SuperCard Mico SD and G6 Lite 4Gb. G6 Generation 3 Review SuperCard SD Review NeoFlash 2005 Competition Review G6 Lite 4Gb Review EZ-Flash IV Review Supercard Mini SD Review M3 Lite aka. M3 Slim Hardware Review The Exhaustive M3 SD, Passkey & Passkey 2 Review Super Card SD & Super Pass 2 Review & Instructions EZ Pass 2 Review/Instructions PassMe Upgrade Review M3 Perfect Adapter CompactFlash 3rd Generation Review SuperCard vs. M3 Adapter Comparison. R4DS M3DS Simpley G6DS Real MK5 NeoFlash. 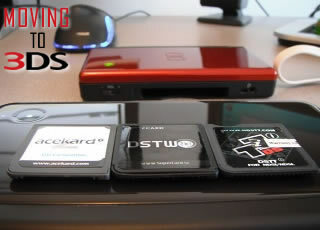 Comming soon - Full review the first 3DS ROM compatible flash card from the Gateway 3DS team! That is not bad as it didn't take long to hack the DS and DSi mode of the 3DS, but it still remains to be seen how long it will take for the N3DS to be fully unlocked for playing multi-game backup copies of 3D games.